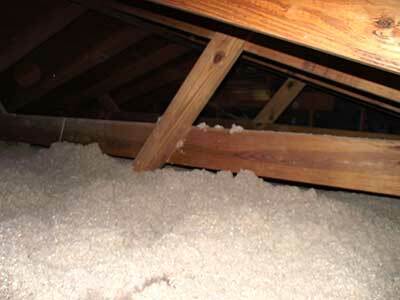 Adding or upgrading insulation in a home attic is the best investment for energy efficiency home improvements. But many homeowners often neglect the need for insulating their HVAC ducts. One way to achieve both is to use blown-in cellulose insulation. If the ducts are lower profile size and sit on the rafters it’s a good solution for improving home energy efficiency. Conditioned air traveling through unconditioned spaces, such through ducts in the attic, degrades the temperature in route to the interior of the home. Homes in colder winter climates can have 68 degree heated air traveling through 30 degree ambient attic air. Conversely, in hotter summer climates attic air can easily exceed 100 degrees. This results in higher energy costs as the HVAC system must work harder to compensate. Insulating duct work can greatly minimize this efficiency loss. If the home has vents in the ceilings there are ducts in the attic. Follow this process to review, repair and insulate duct work. The first step is to inspect ducts to determine if they are already insulated. Most ducts are metal “tubes” and typically installed without any insulation added. Next, check for any cracks or leaks. The best way to accomplish this is with a professional duct leak test. This adds some cost to the project but is will payoff in the long run as it will identify leaks or the need for replacing ducts before wasting money on trying to insulate. A professional will run a “duct blower door” test that identifies all leaks. These can be repaired in most cases using mastic sealant or metal tape products specifically designed for insulation ducts. Also check to ensure the ducts are sealed tightly where they meet the vents in the ceiling. This is a common place where leaks occur. Once the duct work is sealed it’s time to decide on insulation. While in the attic, inspect the insulation as well as the ducts. Chances are, in an older home, the insulation may be lacking. If the insulation is below the tops of the rafters it’s also time to insulate. 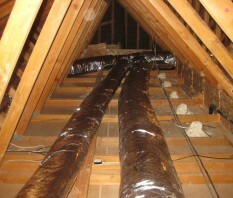 No amount of duct insulating will compensate for an under-insulated attic. The good news, there is a product that can kill two birds with one stone. 2. Properly prepare the attic before adding insulation. Learn more about this important step here. 3. Make sure all ducts are laying on top of the rafters. If any are suspended by strapping, carefully remove the straps and gently lower the ducts. If necessary, consult with an HVAC contractor for assistance. 4. It is possible to install blown-in cellulose insulation as a DIY projects. However, CIMA recommends using a professional insulation contractor to ensure the highest possible benefit from the product. 5. Follow the manufacturers instructions for installing the cellulose insulation using a quality blowing machine and hose. The insulation bags will have the recommended depth and coverage for the product. This is usually sufficient to cover smaller diameter ducts that are resting directly on top of the rafters (follow step one above to verify.) The depth can be slightly increased, where practical, to fully cover the ducts. In many such situations this will insulate all the exposed duct work. However, insulating blanket material can be used to cover duct areas that may not be fully covered by the cellulose. Using cellulose to insulate the attic and the ducts fills all the surface areas more completely to better protect the entire system. Conditioned air is separated from the ambient air allowing the temperature to arrive to the rooms within the house at or closer to the temperature generating at the heating/cooling source. The attic will also be well insulated for maximum overall energy efficiency. This entry was posted in Cellulose Insulation, DIY & Insulation Tips, Energy Savings, Green Products. Bookmark the permalink. Great Article overall. I read your all the stuff and found it very useful. Thanks for sharing. I had brand new electrical installed in my 2nd floor. Can I cover 1900 and 11b boxes that run along my floor in the attic? I also have 16 x 8 ductwork that is covered in the bubble wrap insulation along with a high energy effiecient furnace that has drainage going away from it, all installed on the floor. My only concern is covering up my 1900 and 11b electrical boxes because they have access covers on top. In my attic I had and R49 blown in insulation. Then I had to put my ductwork in the Attic that was under the floor that was falling down that could not be removed because of an older home. Now that my ductwork is up in the attic I have plenty of insulation around a ductwork don’t seem to be insulating what I’m putting out efficient wise. Should I cover up my ductwork my Flex ductwork in the Attic. There can be many reasons for inefficiency in your HVAC system and factors through out the building can contribute. A professional energy audit and blower door test can help identify solutions. You may also want to check our DIY/Tips posts on the blog http://cellulose.org/GreenestInsulation/category/dyi-and-insulation-tips/ for ideas. Thanks for you interest in cellulose insulation. Can I blow in cellulose insulation under my HVAC unit in the attic? I will leave a 2-3′ area around the condensor and blower for access if repairs are needed, but want to fill the insulation at least to the 6″ joist tops so that there is some insulation under and around the units. Is that ok to do? I will then blow in the recommended 14″ in other areas of the attic (including covering the ducts and electric wires). The short answer is yes. The conditions would be that there is no chance for the insulation to be drawn into the unit and that it is not exposed to heat in excess of 194F.Thanks for your question and interest in using cellulose insulation – The Greenest of the Green! I just had my attic re-insulated and the contractor said I could lower my ductwork for better heating and cooling air through the duct work. Is it safe to just let it lay on the new blown in cellulose insulation or should it be all the way to the rafters for support? Just curious what the difference would be? Thanks for using cellulose insulation! There is no reason we are aware of that the duct work could not come into contact with the insulation. Provided your HVAC contractor agrees this should be ok.